(Nanowerk Spotlight) Nanotechnology research groups around the world are actively pursuing the dream of building nanomachines that mimic biological motors and that can convert chemical into mechanical energy to perform certain functions such as transporting cargo and assembling structures and devices at the molecular scale. Sophisticated molecular-size motors have evolved in nature, where they are used in virtually every important biological process. 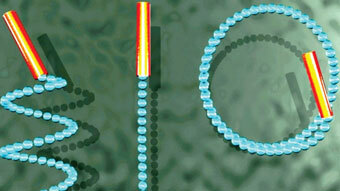 Some fascinating examples in nature are DNA and RNA polymerase, rotary motors such as ATP synthase, and flagella motors. In contrast, the development of synthetic nanomotors that mimic the function of these amazing natural systems and could be used in man-made nanodevices is in its infancy. Nevertheless, scientists are making good progress in achieving cargo transport by artificial nanomachines although often these advances are handicapped by two drawbacks: 1) Extra functionality needs to be given either to the nano- micromachine or to the cargo (e.g. magnetic properties, chemical modification, electrostatic interaction); and 2) the nano cargo transporters can only load one particle at time. Researchers in Germany have now demonstrated the directed loading and transport of microobjects by high propulsion powered tubular microbots driven by a microbubble propulsion mechanism. In a previous Nanowerk Spotlight in 2008 we have reported on an early phase of this work on building self-propelled microjet engines. The team from the Institute for Integrative Nanosciences at IFW Dresden, working with collaborators from the National Institute for Materials Science in Japan, has now demonstrated the ability of their microjets to transport large amounts of cargo in a controlled fashion. "We have demonstrated the easy loading of particles by pumping mechanism instead of chemical modification of the surface of the particles and/or the micromachine" Yongfeng Mei tells Nanowerk. "With our microbots we managed to transport up to 60 large polystyrene particles and up to 5 metallic nanoplates. Up to now, only one specific particle – charged, magnetic or chemically functionalized – was transported by one specific type of nanomotor. Moreover, this was done with spherical microobjects." Reporting their findings in a recent issue of Advanced Functional Materials ("Magnetic Control of Tubular Catalytic Microbots for the Transport, Assembly, and Delivery of Micro-objects"), Mei and his colleagues demonstrate the motion control of tubular microbots as well as the facile loading, transport and delivery of objects in peroxide fuel. The microbots are self-powered by the catalytic decomposition of the peroxide fuel into oxygen bubbles by the platinum layer contained in their inside. Our rolled-up microbots are self-propelled by the bubble propulsion mechanism, which is different than the mechanisms proposed for the nanorod-based nanomotors solving the problem of low propulsion power described these other nanomachines. "Our microbots are much powerful than previous works on artificial catalytic machines and therefore can load and transport a large amount of microparticles" explains Mei. "Moreover, we demonstrate the versatility of our loading mechanism since not only spherical microparticles but also metallic plates can be transported and delivered to specific sites. By using our microbots, the fluid is pumped through the hollow tubular body which induces different kind of particles to be loaded at the mouth of the microbot. The versatile rolled-up technique allows playing with the composition of the tube because different materials can be incorporated in our system." 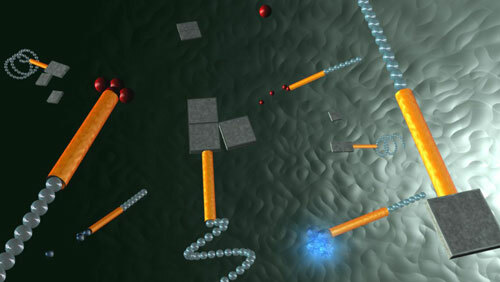 The team synthesized their tubular microbots from thin films according to previously published procedures using 'rolled-up' nanotechnology (see: "Rolling up nanomembranes to build self-propelled microjets"). 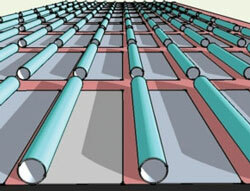 The resulting microtubes were approx. 5 µm in diameter and 50 µm in length. These tubes started to work as valve-less catalytic pumps once hydrogen peroxide was added as chemical fuel. The catalytic decomposition of the peroxide generated microbubbles in the tubular cavities and induced a mechanical force (i.e., pumping of fluid) through the tubes. Mei explains that the suction of fluid into the tubular microbots induces an inward fluid motion that streamlines near the entrance of the tubes, dominating over the Brownian diffusion of the particles to be loaded. "Therefore, when these particles are located close enough to the microbots, they remain adsorbed at the entrance of the tubes. Once the particles are positioned at the entrance of the tube, the suction is inhibited, which allows a Brownian diffusion of the particles away from the tube so that the particles are no longer tightly adsorbed. This movement, in turn allows more fuel to enter the tube and the pumping to restart." "By integrating ferromagnetic layers of thin-films into the tubular walls, we were able to easily direct the motion of the microbots and wirelessly control them by positioning a mechanical actuator containing a permanent magnet" says Mei. "The extraordinary easy control over microbots' movement by changing the direction of the magnetic field during motion helps to specifically load and deliver cargo at the desired place. Microbot motion control can be precisely realized simply by a game pad and a computer program controlling a rotating motor with a permanent magnet located underneath. Bots in these systems align along the magnetic lines." The team also observed that the precise control of the microbots using a magnetic field was not affected by the size of the cargo. "This led us to believe that the transport of a wide variety of cargo should be possible" says Mei. They demonstrated this by having the self-propelled microbots transport nanoplates (25 nm thick and 50 µm wide) on a liquid surface. "The nanoplates contained ferromagnetic layers for easy alignment towards the moving microbots, so that the magnetic field caused the rotation but not a linear displacement of the nanoplates" says Mei. "Once one nanoplate was transported, we directed the microbot to other nanoplates until the loading of four consecutive objects was achieved." According to the team, the presented results are very promising to offer the capability for universal drug delivery systems. They can work as active sensing systems, moving at different speed depending on the chemical present in the solution. They could eventually harvest energy from water, or clean pollutants. One major drawback for biological applications in the current setup is the toxicity of the peroxide fuel. Exploration of biocompatible fuels like glucose is underway but their use for on-chip integration requires more work. "Very recently, we have succeeded in rigorously reducing the toxicity of fuels by introducing enzymes into our rolled-up microtubes, which very efficiently decompose much smaller amounts of hydrogen peroxide into water and oxygen bubbles," says Mei. See here for more on this: "Dynamics of Biocatalytic Microengines Mediated by Variable Friction Control".